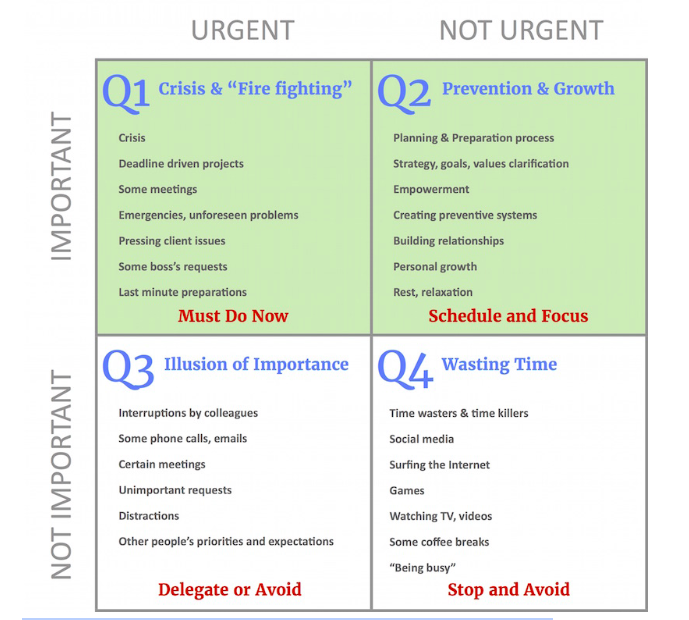 By utilizing the Eisenhower Matrix, you can divide your tasks into 4 different boxes and be able to focus on what is most important, schedule what is important but not urgent, delegate everything you can and then don’t do the things that don’t serve a purpose in your business. To Do: Draw a big box on your paper and then divide that box into 4 little boxes. Putting things to-do on a list frees your mind. But always question what is worth doing first. 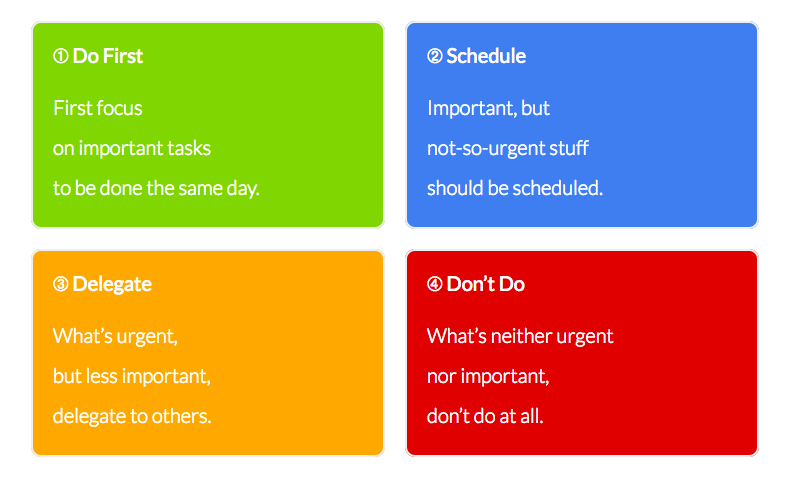 Try limiting yourself to no more than eight tasks per quadrant. Before adding another one, complete the most important one first. Remember: It is not about collecting but finishing tasks. You should always maintain only one list for both business and private tasks. That way you will never be able to complain about not having done anything for your family or yourself at the end of the day. Do not let you or others distract you. Do not let others define your priority. Plan in the morning, then work on your stuff. And in the end, enjoy the feeling of completion. How many of you created your business Facebook page well over a year ago? Or have had a Twitter account for more than a couple years? With social media being around for over 10 years, it is important to make sure your profiles are updated with your current brand image and message. It is key to be consistent in the digital marketing world from your website, social media profiles, to your marketing materials. Everything should have your brand colors, brand message, website, and logo. In this video, we run through each platform on how to check your profiles to make sure they are updated! We spoke briefly last week about KWFinder and how easy it was to find the correct keywords for your business. Knowing your keyword phrases, also known as long tail keywords will help you create that strategy for your blogging and SEO. Keyword Finder is a powerful tool to help you discover your niche keywords. KWFinder helps you discover that sweet spot with keywords that many people are looking for but have a low competition level, meaning it would be easy to rank higher on Google for those mid to lower keywords. The one thing I love about KWFinder is it simple and easy to use. For someone like me who is such a visual person I love the how they show you all the data you need, the ranking, what other sites are using those keywords and what their domain and page authority is. This tool takes the complexity out of keyword research. Be your own keyword expert! This is a free tool, but you are only allowed to have 3 FREE searches per day. First thing, create an account here. If you really want to take your SEO and blogging to the next level and really want to dive deep into finding your long tail keywords, I would suggest looking at their monthly or annual pricing. After your 3 free searches, you will have to either upgrade your plan or wait 24 hours. It is very simple, on the homepage of KWFinder there is a box that says “Enter Keyword” this allows you to search for the keywords you think are important to start with. You can also choose a specific location and language. If you are a local business then the location option would be very beneficial for you. When you are local you want to know what your community is searching for to make sure you re providing them the correct information. Or even if you sell online but only is the U.S. that is something to think of as well. Some of you may be ahead of the game already and have a list of keywords, maybe from an old website company, coach or just your own research, you can upload those into KWFinder, it has to be a CSV file. One thing to remember or be aware of when you are using the location feature when you type in your keyword and the location you are wanting to search you would then click find keywords and KWFinder will show your results on a single screen. It will then display all sorts of data for you, such as the difficulty level of being able to rank for that keyword, cost per click (CPC), search volume. The Third Thing, What does this all mean? How hard it is to rank for that specific keyword. You will see green, yellow and orange buttons with a number in them, ranging from 15-63 or even higher. This is really important for your strategy. If the keyword is in orange which is usually over 45 that means it is going to be very difficult to rank on Google for that keyword. Your strategy at this point should be looking for the yellow and green keywords. 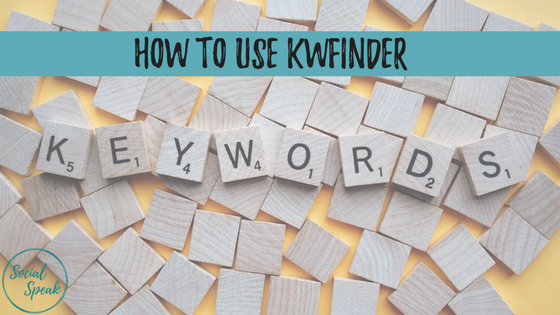 KWFinder shows you different keywords that are similar to the one you searched for, it is also going to tell you how many people a month are searching for that keyword or long tail keyword. For example I searched “Social Media Online Coaching” the ranking was 47 which is yellow meaning it is possible for me to rank on Google with that keyword, but if I wrote about “Social Media Monitoring” which is a 32 it would be easier for me to get on the first page of Goole or other search engines with that long tail keyword. 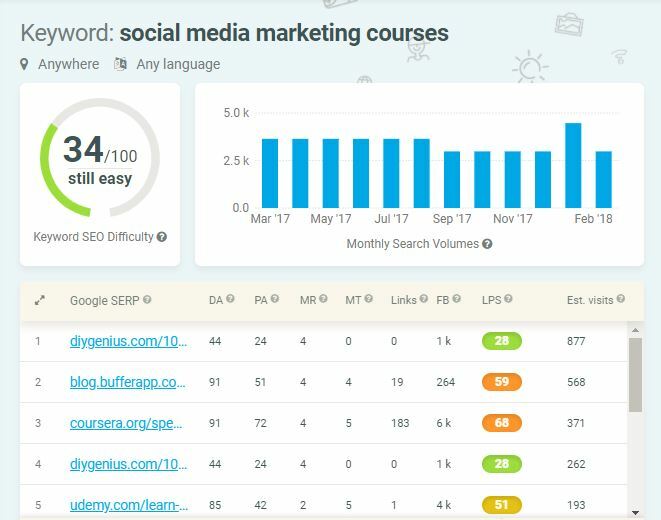 Another feature to look at when look at your keywords, on the right-hand side of the dashboard it will show you what websites are using those words and what the competition level is, the green, yellow or orange rankings. It will also display on each website their DA (Domain Authority) and their PA (Page Authority). Domain Authority (DA) is a search engine ranking score developed by Moz that predicts how well a website will rank on search engine result pages (SERPs). …Domain Authority is calculated by evaluating linking root domains, the number of total links, MozRank, MozTrust, etc. — into a single DA score. 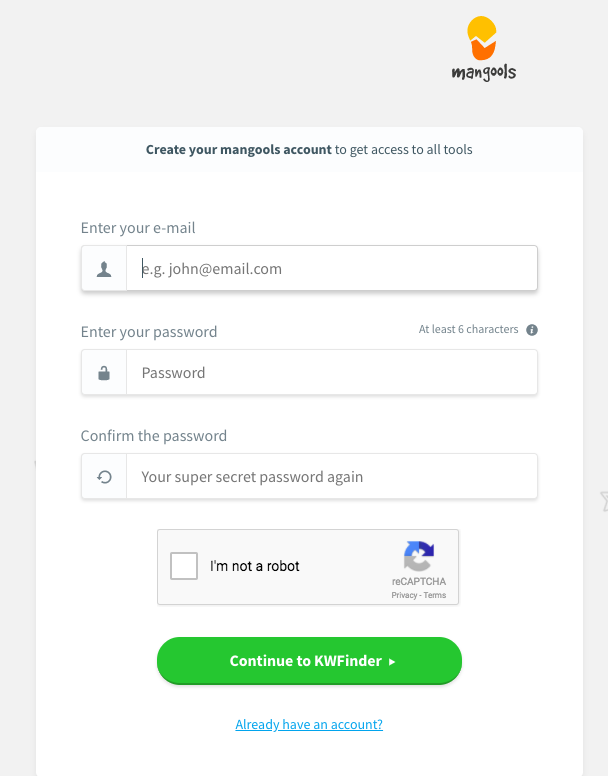 Once you have found the keywords and long tail keywords you want to use, you can create a list within your KWFinder account that you can save to help you manage your search efforts. You may want to think of different lists, categories of your keywords. For us, we may have a list that is “Social Media” and one that is “Digital Marketing Tools” the important reason about having different keyword lists is you will be writing different content on your website, think of the services you offer and how you can write blogs all around those different topics. Those are the keyword lists you need to create. This saves the list to your account, you can always add and delete keywords from that list as you need to. You can also download your list into a CSV file if you would rather do that. One thing to always remember when adding your keywords to your list, it is better to add the easy (green) and mid (yellow) to your list rather than hard (orange). This amazing tool provides you a ton of powerful information to help you succeed with your SEO and Blogging strategy. In today’s digital marketing world it is important to always stay abreast of the hottest topics and trends in your industry and become even more of an expert than you already are. By utilizing KWFinder and all of its bells and whistles you will be able to find those relevant long tail keywords for you and your business, taking your digital marketing to the next level. This is an efficient way to stay on top of those trends and searches and will save you a ton of time in the long run! With Search Engine Optimization becoming more and more difficult as competition continues to emerge, your business can set itself apart by Podcasting and Video Marketing. Podcasts are a powerful marketing tool. Over the years, it has garnered immense popularity, with more and more businesses discovering how it can benefit their company. If you still haven’t incorporated podcasting into your marketing campaign, then you’re losing out on a lot of business opportunities. Here are 4 reasons why your business needs to be podcasting. As mentioned above, podcasting is a powerful marketing tool. It can help you reach new audience, drive traffic to your site, and even build a community. By broadcasting podcasts regularly, it will help develop your company’s brand to make it a household name. A lot of people are put off by the seemingly confusing technical aspects of recording a podcast. Producing a podcast is not as complicated as what most people think. You do not need a lot of money either to start a podcast. To start, all you need is a microphone, a headset, a recording device, and editing software. A good wifi connection is also important for uploading the files. Humans have a very short attention span. In fact, an average person has an average attention span of 8 seconds. If you want to get your message across, then you need to make it easier for your audience to consume and understand what you’re trying to say. Podcasts can help you do that. A 1,500-word article may provide your audience the information they need. However, not everyone will have the patience to read through the entire article. With podcasts, you can convey the message in a more interactive way. Plus, people can listen to podcasts during their commute or while doing other things at work or at home. Podcasts provides a more personal way of getting information. Instead of just reading content on your blog or email, they get to hear your voice through podcasts. This makes your brand more personable. Overtime, people will be more familiar of your voice and presentation style. Building a relationship with your audience helps in building trust. Once you gain their trust, it would be easier for you to turn them into paying customers. After all, people are more likely to buy something from someone they trust. The use of video in content marketing is on the rise. A lot of businesses are centering their marketing strategies on videos to present content in a more personal, compelling way. Here are 4 reasons why your business should use video marketing. Among the different types of content, video content seem to be the most effective in capturing people’s attention. With the sheer amount of new content being published on a daily basis, it can be difficult to cut through the noise. For some people, reading a long blog post can be boring. In an age of short attention span, video makes it easier for time-constrained viewers to consume and digest complex content in a shorter amount of time. If you want to capture the attention of your target audience, try creating more videos. According to a study that was conducted by Moz, videos get a lot more engagement as compared to other types of content such plain text posts or photos. In the said study, they revealed that posts with videos receive nearly 300% more inbound links. There are numerous types of videos that you can use for your business. You can create demonstrations, animated explainer videos or how-to videos. You may also compile photos and videos from people who use your products and use it to promote your products. No matter what video you choose, make sure that the videos you create are congruent with your overall style and ethos of your brand. Contrary to what most people think, Google doesn’t just use text-based content to assess the relevancy of your web page to a specific keyword. It also takes into account other types of content you use, including photos, videos, and a combination of text and photos. For best results, we suggest that you include a transcript of your video. Not only will it be beneficial for your audience; it can also help search engines to understand the relevancy of the video. Also, don’t forget to include the keywords in your video’s meta tags. Most people do almost everything on their smartphone. They use it to communicate with their family, friends, and colleagues, research information, schedule meetings, and even order a pizza. Almost half of the adult population say they can’t live without their smartphones. In today’s digital world, videos can easily be accessed with a click of a button. By incorporating videos to your marketing strategy, you get to communicate your desired message and encourage your desired action. As technology continues to evolve, it may come as no surprise that the marketplace has become increasingly digital. In an attempt to capture a growing and lucrative online marketplace, business owners are beefing up existing marketing efforts with digital marketing strategies. They are doing everything they can to keep up. Here are 3 ways digital marketing can help grow your business. Whether you’re managing an e-commerce business or a brick and mortar store, it is important now more than ever to have a solid online presence. According to studies, 72% of consumers are already connecting with brands through their various digital marketing channels. Having a strong online presence makes it easier for potential customers to find you. Remember, your competitors are working hard to build an online presence. If people can’t find you online, then they are likely to come across your competition. Thanks to the internet, almost everything can be done on a smart phone. It allows you to communicate with your family and friends, keep up to date with current events, do research, and even go shopping. In the age of digitalization, more and more people prefer to shop online than visit the local stores. After all, online shopping is more convenient. Plus, all the items your purchased will be delivered right at your doorstep. With the increasing popularity of online shopping, it is important harness the power of online marketing. Not only will it get your products and services in front of potential customers; it can also help you generate more sales. Not too long ago, big businesses would put up billboards and create TV commercials in the hopes of reaching their audience. While there is no denying that such methods are effective, they can be too expensive for small business owners. With digital marketing, small business owners and marketers can get the word out about their business without having to spend a huge sum of money; thus, allowing them to compete with large corporations. Since majority of their target audience is already spending most of their time online, online marketing provides a quick and easy way to reach your target audience. SEO is always changing and evolving. With this continuous change, a lot of marketers and business owners are left in a state of constant adaption. Thanks to the internet and blogs, it is easier now more than ever to share information. A lot of people want to share their knowledge with others. Unfortunately, not everything you read on the internet is true. Often, false ideas and wrong information gets mixed up with facts. Because of this, a lot of myths and misconceptions remain no matter how many experts debunk them. There are lots of misconceptions about SEO that you should know about. Here are some of the biggest SEO myths you should leave behind in 2017. Back in the early years of search engine, people used to shove as many SEO keywords as possible onto a web page to improve SEO rankings. Using keyword in your content can get your website ranked high in search engines. But overly stuffing your content with your keyword isn’t a good thing either. If you do, your content will be perceived as spam, and your site will be penalized. When using keywords, make sure you incorporate them as seamlessly as possible into your content. Also, make sure that the keyword density doesn’t go over 5%. Otherwise, it will be viewed as spam. Google doesn’t use social metrics such as the number of shares, likes, and followers for SEO. But that doesn’t necessarily mean that your social media efforts are useless. Each post you make will be categorized as a page. With millions of social media posts, along with other contents published on the internet on a daily basis, not everything gets indexed by Google. But when a social media post goes viral, it triggers a signal in the Google algorithm. This puts your content in front of the right users; thus, increasing engagements and driving more traffic to your site. Social media may not directly affect search engine rankings, but it can have significant secondary effects on your SEO. It is true that content is king. In fact, Google rewards websites that generate valuable content regularly by giving it a higher ranking in the search engine results page. While creating well-researched and relevant content is a great starting point, it’s not enough to get you to the first page of Google. It may be impossible for crawlers to find your content if your website isn’t optimized. You may have a blog full of good quality content and you make it a habit to publish a new one every week, but there is no point in writing great content if no one is aware of your work. Moving from 0 to 100,000 visitors takes a lot of leg work, no matter how easy a blog post or interview makes it sound. Unless of course you are buying ads, which provides a short-term solution, you’ll need to get working! Depending on your industry, Pinterest. Reddit, Quora, and LinkedIn can all provide avenues to increase your site traffic. I’ll take a look at each below. In order for any of these to be successful, however, you need to make sure there is a reason to go to your website. I recommend a combination of new blog posts, freebies, and diverse media (videos, infographics, etc). Pinterest: On Pinterest there are a variety of ways you can boost your traffic. You need to start with the basics. Complete your profile and confirm your website. By confirming your account, your profile tends to rank higher in search results. Also, let people know what to expect if they follow you. Use Rich Pins. These add more content to your pins from your site, which can increase their impressions and clicks. Optimize Descriptions: Not only do you want your pins and boards to appear in search results, you also want to entice people to click them. Engage: Don’t just go through and Follow everyone you can to gain Followers, go through and Like, Comment, and Repin appropriate Pins before Following someone (yes, there are automation tools like this, such as NinjaPinner or Tailwind*). Participate in Group Boards: Find group boards that fit your business and request to join them. Of course follow the rules when you pin to these boards, but they open the door to a much wider audience (BoardBooster* is great for automating your pinning). Reddit: The goal on Reddit is to get a lot of Upvotes. When a post makes it big, it can bring thousands of visitors to your site. Reddit is set up to prevent spammers, so you do need to be cautious about what type of content you are posting here. Find your subreddits: These are the subcategories that you can post to. You need to find the ones that is made up of your target market. You can find these subreddits through searches on Reddit. Look for the results that are relevant and have high traffic. You can also use Metareddit to find subreddits. Just make sure that the subreddits you decide on FIT your topic and aren’t too broad. Research the posts in the Subreddit: take note if you see consistencies in the posts and what the most upvoted posts tend to be. You will want to emulate what works within each specific subreddit. Participate: Hold off on posting your links for just a bit more and focus your energy on commenting on other posts (new accounts can only comment once every 10 minutes or so). Post your own links! But only if it fits the guidelines for the subreddit. When you are posting, don’t hesitate to test different headlines and time of day. Always be clear about what the post is about and then don’t try to upvote your own things. Redditors can smell marketing from a mile away, so don’t try to hide what you are doing. Of course sometimes, even if you get downvotes, you still may make a sale, which has happened a few times to me). Quora: We are just starting out on Quora, so there are other folks who can provide better insight here, but participate and provide great answers to questions. On Quora the best way to is to get traffic to your website is to find questions to answer have followers, but less than 10 answers. This means you have found a question people are interested in learning more about, but you can have your answer stand out compared to others. Don’t be afraid to answer questions that aren’t directly related to your business, either. You have expertise in a lot of different areas, so you can more generally have your profile stand out if you start receiving up votes across the board. Research how other people are answering the question. Are they writing quick responses or going into detail? This can show you how you need to be writing the replies. LinkedIn: If you are B2B, you need to be on LinkedIn. I highly recommend using Group Discussions to push out your blog posts and LinkedIn Articles to re-publish your popular blogs with a call to action back to your site. Find Groups: LinkedIn has switched around their interface, but the goal is to find active groups that fit your target market. Participate: Just like with Reddit and Pinterest, you need to participate. This means liking and commenting on other members’ discussions. Post Discussions: Often your discussion will be flagged if you just post the link to the blog post, so you want to start by asking a question as the discussion title. In the body of the discussion, use some of your blog post and then provide the link to your site. With each of these tactics, you need to be CONSISTENT and focus on sharing high-quality content. If you want to learn more about how to grow your traffic, please join my free email course on digital marketing. As a marketing professional, it is imperative to be able to find our client’s prospects online. Our clients often ask us how we make sure that the folks we are targeting fit their ideal customer persona, so I assume this is a common question for business owners. I wanted to lay out the steps we take so you can follow them for your own business. Though many of us have accounts on Twitter, LinkedIn, Facebook, SnapChat, Tumblr, etc, we can assume there are only one or two networks where we focus most of our online activity. Luckily, numerous agencies share data freely about the types of individuals that are found on each network and network growth over time. For example, take a look at this chart from Smart Insights. 16-34 year olds dominate most networks, but if your market is 55-64 year olds (green marker), I would highly consider targeting LinkedIn, Facebook, and YouTube. SnapChat wouldn’t be a valuable network for this age group. Additionally, though it is common to hear that Facebook is on its way out, this is still the largest network of users. Twitter on the other hand has remained fairly stagnant over the past few years. Data like this may sway where you want to put your attention on social media. Write a description of your ideal customer. How old are they, what job do they hold, what do they do in their free time? Look at the statistics of the social media networks, is there somewhere this person is most likely to be found (and active)? Beyond data, our team also analyses what works for your competition. We often hear a client raving about how well Business X uses Facebook, for example, but when we actually take a look, their posts aren’t receiving any traction or they only are posting once per month. This leads to a conversation about what our client’s are viewing as a success. By “spying” on competition, you can learn what has worked well, what seems to be a waste of time, and they types of graphics and posts your target market is used to seeing on each social media network. Brainstorm a list of your competitors and other businesses that sell to your target market. Then find them on social media. Gather notes on their network size, average number of likes, shares, RT’s, and comments on their posts, the topics they post about, and if there is one network that seems to garner most of their attention. You can also use Fanpage Karma – http://www.fanpagekarma.com/ – to gather insights. You don’t need to necessarily present this research in any specific way unless you are proposing it to a board or others at your organization. I use this research as a gut check and to establish expectations for clients. I do believe that if you are 100% devoted to a particular network, you can find results, so don’t necessarily cross off SnapChat, for example, if your competition hasn’t jumped on board yet. My recommendation is to use this research from “spying” on your competition to gain a better understanding of the online landscape within your industry. Lastly, take a moment to reflect on your own interests. We’ve already looked at the overall trends for social media networks and seeing how your competition uses social media, but how do YOU use and interact with social media. Is there one network you absolutely love? No matter what the research says, if you are passionate about a specific social media network, start there. Even though there are few 65+ individuals using SnapChat, you can still work to capture a portion of these individuals if you commit to working SnapChat. If you are just jumping in, take a moment to consider where you would like to spend your time marketing your business. Use this as a starting point. You can always add more social media networks once you are confident in the process of marketing your business online. 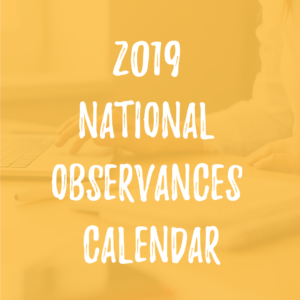 The New Year is a great time for business owners to reflect on the things they have accomplished in the previous year. This is also a great time to list down your business goals and what you plan to achieve this year. Most people resolve to lose weight, eat healthier and to quit smoking. Why not make some for your business as well? Resolve 2018 to be the best year for your business and make it happen. Here are 3 resolutions for better digital marketing. Get your head start this year with this list of resolutions. With one-quarter of global web searches conducted on a mobile device, you are ultimately losing sales if you aren’t optimized for mobile. In order for your business to achieve its highest potential and profit, make the user experience clear and pleasant. Remember that your visitors are viewing your page on a device with a smaller screen, so be sure to keep your site simple, consistent and easy to navigate. Page speed is also important for mobile users. They are on the go and aren’t willing to wait. In fact, studies suggest that 57% of mobile users will abandon your site if it takes more than 3 seconds to load. Whether you’re running a multinational company or a small business, blogging is important for your business. Updating your blog on a regular basis and providing your audience with fresh, well written articles will help position your brand as an industry leader. In addition, you can use this marketing tactic to drive traffic to your site and increase your SEO ranking. If you still don’t have a business blog or aren’t posting new content, now would be a great time to start. Understanding your site’s analytics allows you to track the effectiveness of your online marketing campaigns. You want to know how your customers have reached your site, how long they stay on your site, as well as how they are navigating your site. You need to be able to track these behaviors to help you determine which features of your website are actually driving revenue and which aren’t.